What’s the difference between a megacorporation and a mafia? One of them isn’t being watched by the government. They say absolute power corrupts absolutely, but some would argue that corruption comes first. Getting to the top requires cunning, guile, and influence. Staying there requires wealth, prestige, and firepower. Great leaders possess all of these qualities, whether they run the corporations which control our lives or the criminal empires which keep the corps in check. 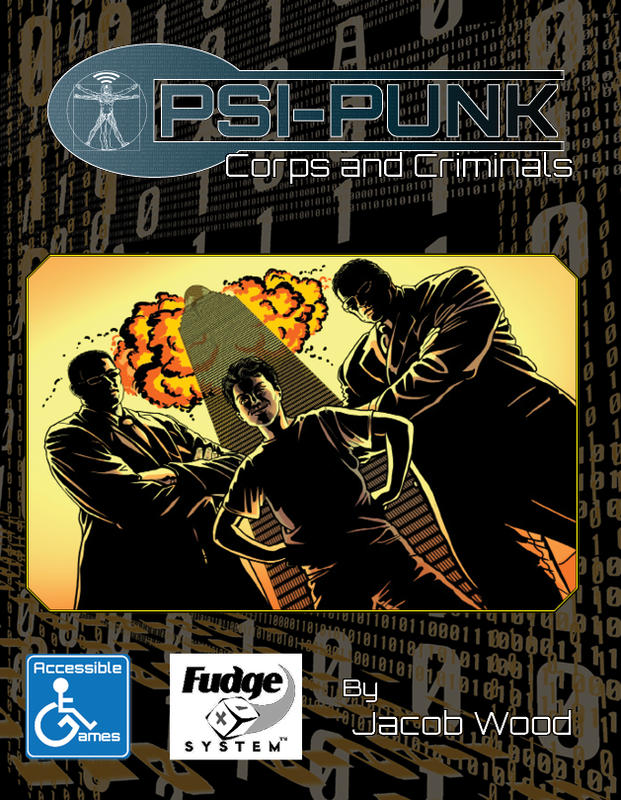 Corps and Criminals introduces you to several different types of organizations to use in your next game of Psi-punk. From street gangs who are working their way up to the brightest beacons of capitalism, you’ll find plenty of organizations to align with—or against. 8 Megacorps, each with a unique corporate culture, advice for GMs on how they fit into your game and tips for players on how to include them in your background. 12 Cartels of 3 varieties: ghost cartels, arms cartels, and trafficking cartels. GM advice on how each of these organizations fit into your world and how to interact with them. 14 gangs with their own motives and methods, with sample NPCs for their leaders and goons. 7 Mafias from around the world, including sample NPCs for their bosses and henchmen. Plenty of inspiration for Game Masters and players. Psi-punk is an RPG for the Fudge role-playing system. It combines a futuristic cyberpunk setting with a healthy dose of psionics to bring you a unique alternate world rife with intrigue, espionage, action, and adventure. The Psi-punk core book is available on DriveThruRPG.